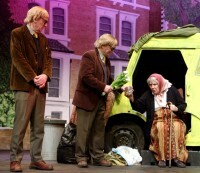 'The Lady in the Van' is on at the ADC Theatre in Cambridge this week, and we were treated to a little bit from this on last week's programme. Penned by Alan Bennett, the short story is basically that a rather strange lady called Miss Shepherd turned up on his doorstep - perhaps to overwinter a little, and ended up staying for fifteen years. First of all, it is an extraordinary play. 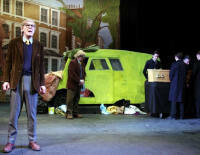 I think it is a lovely piece of theatre - a really entertaining evening, but it is a really difficult thing to do, partly because you have got to have two people on stage capable of playing Alan Bennett - for goodness sake - which is not at all easy. David Foyle and Barry Brown were absolutely splendid; they really were flawless from start to finish. 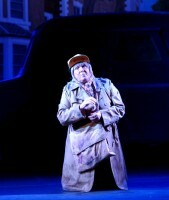 Also it is a play that has a huge range of emotions and tones to it. It is very funny, and the comedy is delivered beautifully timed by Bawds. But it has a deep and quite dark serious side to it as well, as Alan Bennett and his relationship with this odd woman, who he knows so little about, deepens, and he tries to find out about her. 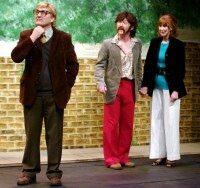 So you have got to convey all that, you have got to get the laughs, but you have got to do the seriousness. 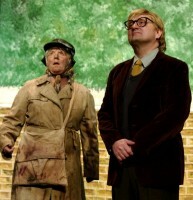 Rosemary Eason played Miss Shepherd. It is a whale of a part, it is a huge part, and I thought she was just fabulous. 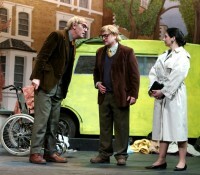 I have to say that the other leading actor on stage was the van! The van was good. 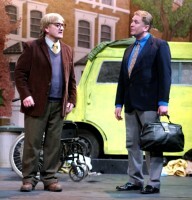 The van underwent a couple of colour changes and its inside and its outside are both key parts. 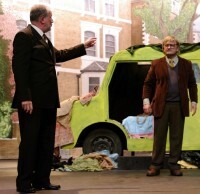 There are some scenes that are done in the van where Miss Shepherd is staying on stage all the time which are very funny. And what an amazing thing to do! We were hearing last week about how it was not a very big garden and Alan Bennett was practically living with this woman for fifteen years, and his mother at some point as well. It is an extraordinarily generous thing that he did. It is a very cleverly constructed play as you would expect from Alan Bennett really because the reason there are two Alan Bennetts on stage are that it gives them a chance - one to narrate and one to be in the scenes, but also to talk about the morality, if you like, of about writing about this woman - about using her life as material for a play and a book and all that sort of thing. And it is really really; it switches so quickly. Although it is a big cast the focus on those three characters is quite intense. Of course, we actually so rarely send a bouquet to those people who are in the wardrobe department but if you go along to see this show you will realise why we have got to shout from the rafters 'Well Done' to the wardrobe department in this particular one because of Miss Shepherd's costumes. Judy Hanson and Julie Maclean came out with some fabulous accessories for her. Obviously as I have said the thing about her is this filthy mac she never washes. She is a very layered woman and they are all as filthy as each other, although mercifully they did not do it so authentically that you could smell it from Row D you could imagine that you could smell it from Row D! The socks and slippers, the hats and scarves, I thought were wonderful and I take my hat off to them (if you will pardon the pun) for providing these accessories because it was an added note of humour. 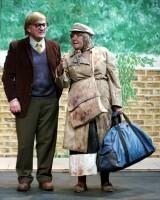 Miss Shepherd, although she was filthy, it would have been easy just to content ourselves with one outfit. She did at least change her socks and I thought it was a brilliant touch of humour. Well done Bawds! 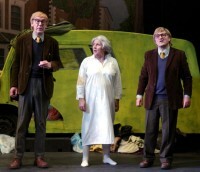 Not everyone could cope with an eccentric old lady living in a battered van in the drive of their home for fifteen years but that is what writer Alan Bennett did: and he documents his very odd long-term relationship with 'Miss Shepherd' and the frustrating and hilarious encounters with neighbours, doctors and the social services in his diaries. Bennett has now turned these anecdotal diary notes into a stage play which I didn't feel worked as well as I had heard it did. 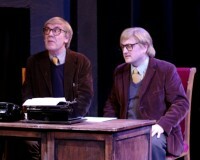 It is probably sacrilegious of me given the great esteem in which Alan Bennett is held by people, myself included, to say it but I personally feel the play is wordy, at times repetitive, and definitely over-long. 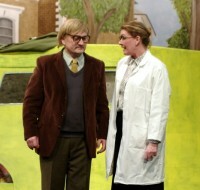 The evening was saved for me by the way Bawds met the challenge of this play: which they did marvellously well. 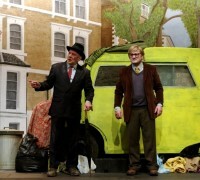 They provided a visually stunning set with a mesmerising backcloth (painted by students of Anglia Ruskin University's theatre design course) and a fantastically believable van which even changed colour! (courtesy of Tony Broscomb and the Penguin Club). 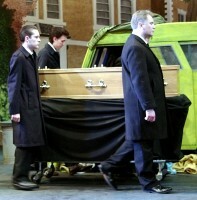 The lighting, sound and props were excellent and costumes just right. Under Richard People's firm directorial hand the acting was beyond reproach. 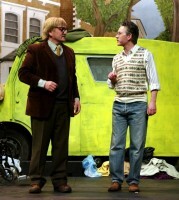 Barry Brown and David Foyle as the two Alans were totally believable and, much of the time, worked as one. 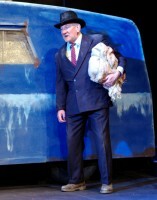 In fact Barry Brown gave such a realistic impersonation of Bennett's voice it was quite spooky. 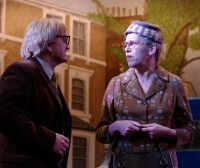 Rosemary Eason was a stunning success as Miss Shepherd: the thought which had gone in to the characterisation and clothing (especially the hats and socks) was impressive. The ten other very minor roles were played with confidence by good strong actors adding to the overall strength of the acting. Whilst there was much to commend from the production point of view sadly, for me, the play itself did not live up to expectations.